Third time’s the charm when climbing Everest? Tents perch like bright lunchboxes on a crust of black rock, forked with ice and snow. For Dr. TA Loeffler, graduate of the Master’s Experiential Education program at MNSU, this tiny base camp is a temporary home. Loeffler is about to attempt a summit of Mount Everest, the world’s highest mountain, for the third time. There are many titles to describe Loeffler: she is a professor of Outdoor Education and Recreation at the Memorial University of Newfoundland, a professional keynote speaker, and a vivid writer. She has a wealth of outdoor experiences. “Climbing Denali for my fortieth birthday provided a seed to want to climb Everest,” Loeffler told The Reporter. It was after Denali that TA set a goal of climbing all “Seven Summits,” which are the highest peaks on each continent. Her experiences with sky, snow, and sweat stretch endless over the page. Loeffler has an active relationship with multiple elementary school classes. These classes follow her journey through a curriculum she and her curricular team develop on her blog. In audio-posts, Loeffler gives updates on her whereabouts and she also answers questions from students, teachers, and whole classes. 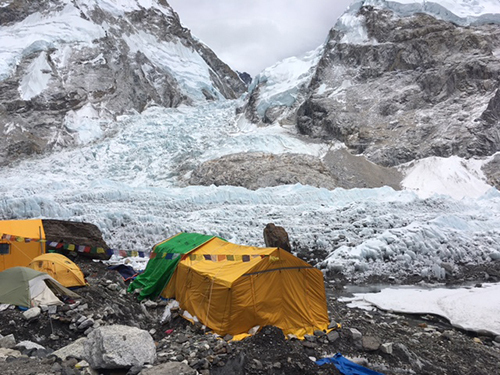 Currently, Loeffler is at base camp awaiting her first trek up the icefall, which will happen around midnight between Thursday and Friday. She will be carrying a pack of essential supplies weighing around 35 to 40 pounds. This poundage depends on the number of items she will be able to send ahead of her. She and her team cook using a specialized stove fueled by a mix of propane and butane. This stove is designed to maximize all available heat. All their water must come from melting ice and snow. Readers can follow TA on her blog at https://taloeffler.com. She also frequently updates her Facebook and Twitter accounts. ← Well, what do you have to say for yourself?